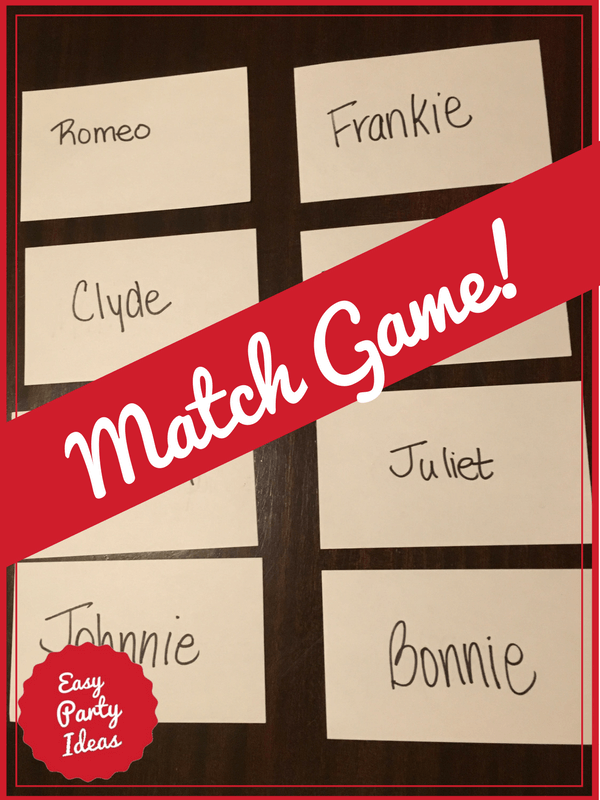 This Match Game is a great way to get everyone mixing and mingling at your party! Before the party, make a list of famous couples. For example, Anthony and Cleopatra, George and Martha Washington, etc. Next, write the name of one half of the famous couple on one nametag, and the other name on another name tag. So in our example, one name tag will read "Anthony" and one tag will read "Cleopatra", another will read "George Washington", etc. Make sure you have enough for each guest plus a few extra - you never know when an unexpected guest might turn up! As guests arrive to your party, give each one a name tag. Give the name tags out in random order. But don't let your guests put on the name tag!! You and the guest should be the only ones who know what their particular name tag says. Instruct each guest that they should mingle, asking yes or no questions, until he or she finds their "other half". Once each member of the famous couple finds each other, they can put on their name tags. This is a great game to play at an Oscar watching party or other Hollywood or celebrity themed party. Everyone will think you have such creative party theme ideas!! This game also works great for a large group of people at your party, since it is a multiplayer game.